When I was a kid, I loved taking the walk up the hill of a driveway we had, to go to the mailbox and pick up the mail for my parents. To me it was the best thing ever – the idea that you get stuff sent to you on a regular basis. Of course, as I grew up I realized that 98% of the things that we receive in the mail are either junk or bills – not the most inspiring “gifts” I thought they were when I was younger. My interest in the mail led me to my recent habit of checking my mail only when I guess that the tiny box might be crammed so full, the post man is probably starting to fume and plot ways to have me evicted. So why is it that I now get excited for my mail each month and set a reminder in my new iPhone 5 (with Siri’s help of course) to check it? 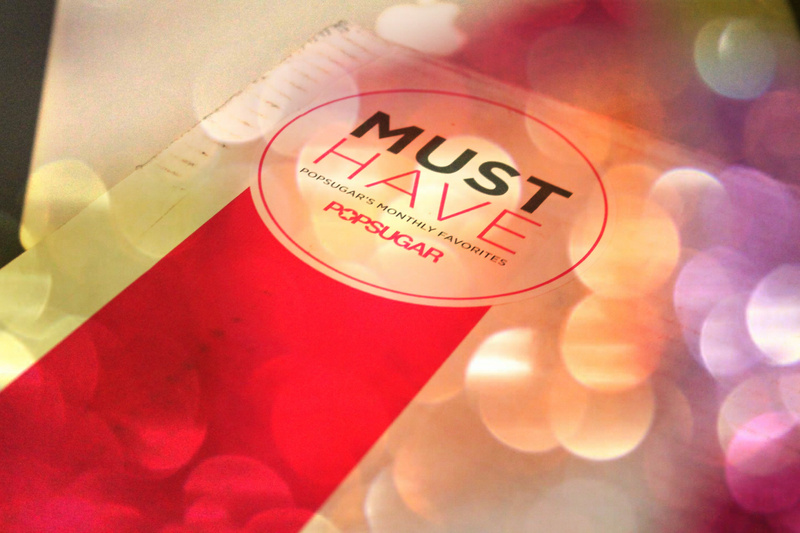 That would be because of Popsugar’s Must Have Box of course! If you haven’t already discovered the Sugar Inc. network of blogs, check them out, you will love them. They’re more of establishment now in the online publishing world with specific blogs for pretty much every interest and passion (gadgets, fashion, beauty, home decor, weddings, finances, etc.). Popsugar was really the initial blog and continues to be probably one of the most well known. Since they cover such a wide range of material and get pitched by every company, big and small, they have cultivated not only great taste, but amazing recommendations for products and services. Thus the creation of their Popsugar Must Have Box. You pay a minimum of $35 (you can choose to pre-purchase a number of months to get even better values) per month (you can cancel at any time, but you do have to subscribe in some way the first time). 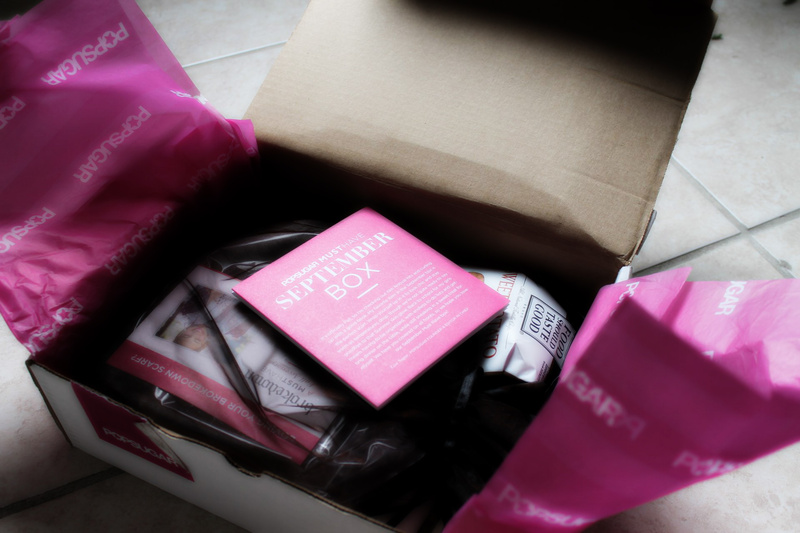 Each month the Popsugar editors hand-select items in beauty, fashion, home, fitness and food, and package it up and send it to you all in one nice package. You get the box delivered just overflowing with full-sized products and premium items worth over $100. Now, I subscribed back at the end of July and received my first box at the end of August. It was like my birthday all over again! Stuffed full with amazing products, I loved unwrapping the bright pink paper and sorting through all the new and cool items they sent. Most were things I was able to use right away, though they also had some coupons and “experience” type things. The best part was that, for the most part, everything was new to me! The products were unique, usable things that I probably wouldn’t normally stumble across. The fact that the editors pick out their favorite items, time them for the appropriate month, and then tell you why they love it and how they use it. These are things that a number of other people have not only put to the test, but that have surpassed expectations. You can see a further breakdown and explanation of each of the items on their website. My favorite items so far are the Kitsch Hair Ties, which finally solve my dilemma of having hair elastics around my wrist all day, and the Perks of Being a Wallflower book and movie tickets, which I’ve been planning to ready/see for a while. The Food Should Taste Good Sweet Potato tortilla chips were also delicious and by far my favorite food item in the box. Meanwhile, not only was the Brokedown Scarf was not only soft and matches everything (I wore it with a little purple dress on Monday), but it also has all the makings of a great gift idea as we head into the holiday season! 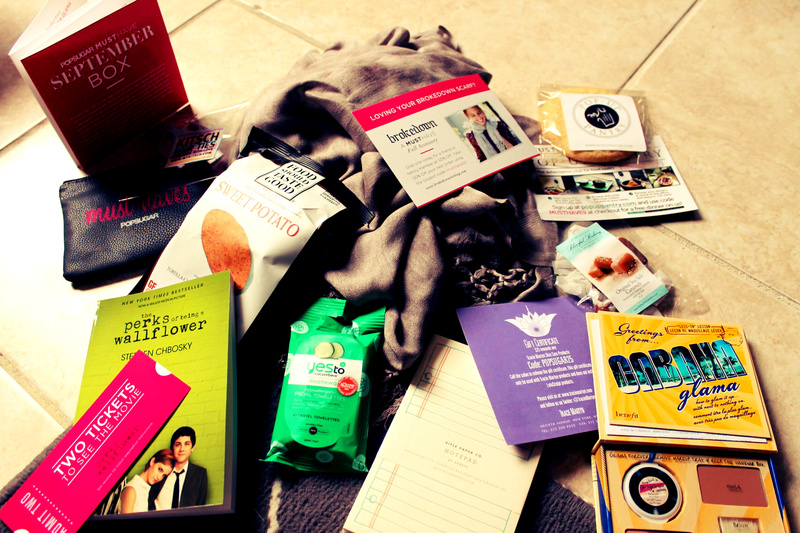 And thanks to Popsugar and Brokedown, the Must Have Box also included a discount coupon off your first order. Han-dee. If you aren’t already salivating at the thought of getting all these delicious goodies in one box, once a month, then just peruse some of the other boxes they put together and get yourself signed up to try a month. If you don’t love getting mail more after you experience one of the Must Have Boxes, come talk to me. Have you or will you be trying this? Are there any other subscription-type trial services you love? Posted in Beauty, Books, Christmas, Fitness, Food, Happiness, Home Decor, Shopping, Things I Love | Tags: blog, fashion, gift ideas, Must Have Box, Popsugar, subscription, Sugar Inc.
« Let the holiday celebrations begin!